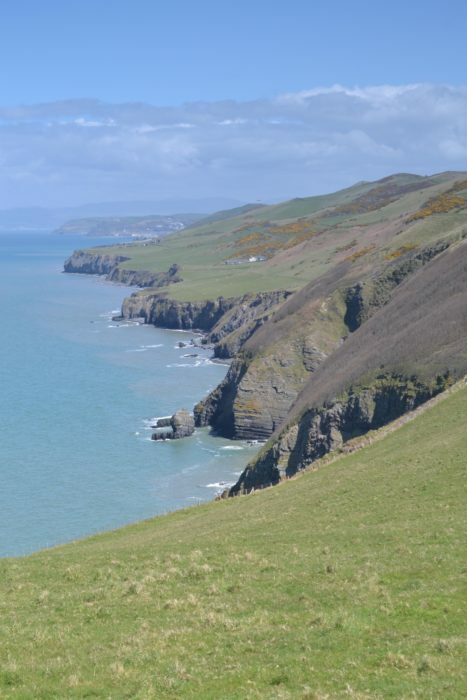 The walk down Cardigan Bay requires a steady pace and an inquisitive nature, for there is much to explore and appreciate. A train comes to a halt by the waterfront and people spill out on to the platform. Most make their way past the harbour and into the centre of town. But some, obviously walkers, head off in the opposite direction. 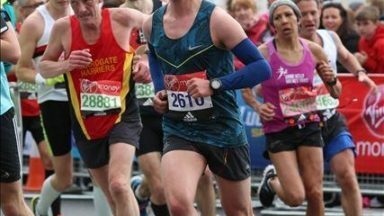 The train is on the narrow-gauge Ffestiniog Railway, the town is Portthmadoc and the walkers are setting out on the marvellous stretch of Wales Coast Path down Cardigan Bay. 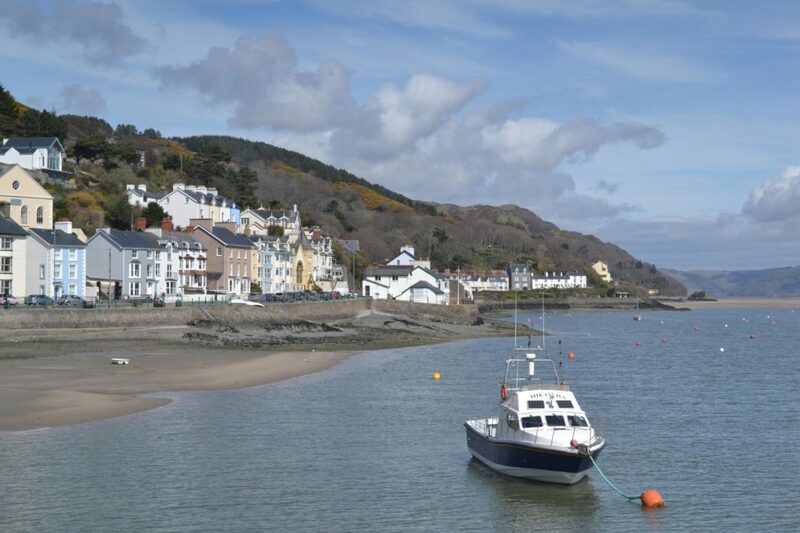 This walk heads along the coast of Snowdonia, rounds the Dyfi estuary and follows the Ceredigian Coast Path to Cardigan. It would be quite possible to accomplish this 230km walk in about 10 long days. This would miss the point, for this is a walk to be savoured. As well as the immensely varied and scenic coast, with stunning views, there are many opportunities to divert from the path: there are castles and tiny churches, fascinating town trails, museums and narrow-gauge railways, and many attractive towns and villages to explore. There is an immensely rich wildlife throughout the year. And on its way over high, rugged cliffs, across deep cwms, beside salt marshes and dunes and down long sandy beaches, the walk is imbued with a great sense of history, from the early settlers to the Romans, the age of saints and the early churches, and the centuries of conflict in the various attempts to unite Wales into a single country. You can try to imagine, too, the huge amount of industrial activity that once went on along the coast: lime burning, shipbuilding in even the smallest of bays, and the export of slate brought down to the coast from well inland on the narrow-gauge railways. Just a couple of kilometres out of Porthmadoc comes the first diversion: a visit to the eclectic mix of buildings that make up Portmeirion village, the brainchild of architect Clough Williams Ellis. The original coast path then went on a beautiful loop via Maentwrog, before it was re-routed along the new road across the Dwyryd. This was a lovely walk via sequestered Llyn Mair and in sight of the rough knuckle ends of the Rhinogs. It is well worth building into the itinerary. South now, beside salt marshes and past the tiny Ynys church with its ancient 12th-century gravestone, the next highlight (and off-route detour) comes in sight. 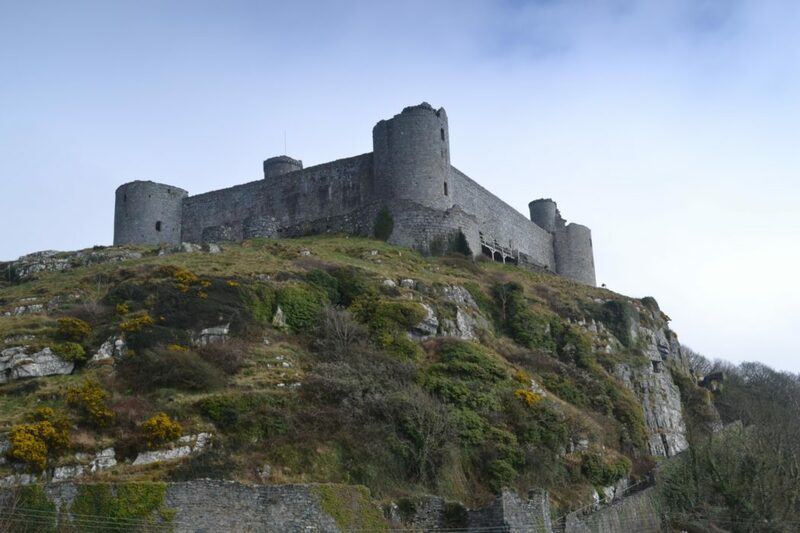 Harlech Castle seems to have grown from the high crags upon which it was built, overlooking the original coastline, where now there is the huge Morfa Harlech dune system. Passing the tiny church of St Tanwg, half-buried in these dunes, the way rounds Pensarn Harbour and a long beach and, after some cross-country rambling, brings the path to Tal-y-bont. 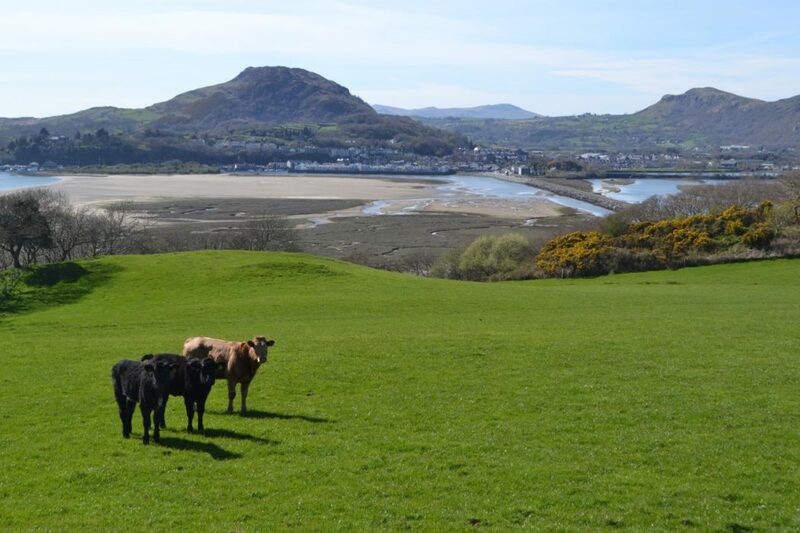 The official route follows the main road down to Barmouth, but at low tide the long sandy beach would be an alternative. 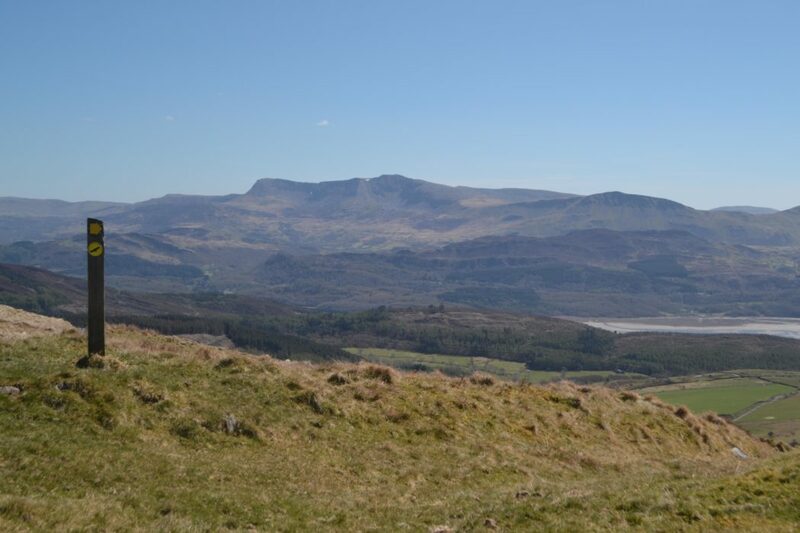 Even better is to head for the hills and follow part of the Ardudwy Way through the southern extension of the Rhinogs ridge, a walk that includes delectable woods beside a tumbling river, open country and great views, not least to mighty Cadair Idris. 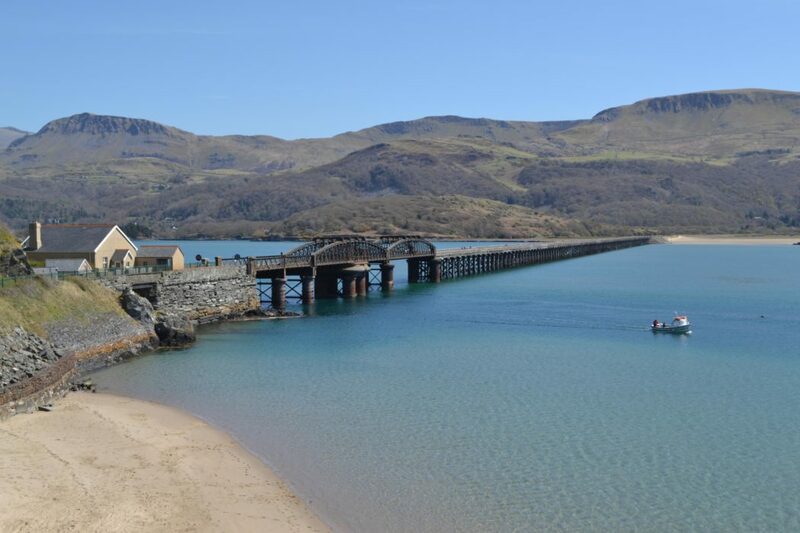 Southward, across the beautiful Mawddach estuary, the railway hugs the coast, so the path takes a scenic route a little inland. (Incidentally, with its many stations between Porthmadoc and Aberystwyth, it would be possible to use this railway as the start or finish points for a number of the day walks). At Tywyn there comes another chance to break off for a day, by taking the Talyllyn Railway up to Nant Gwernol. 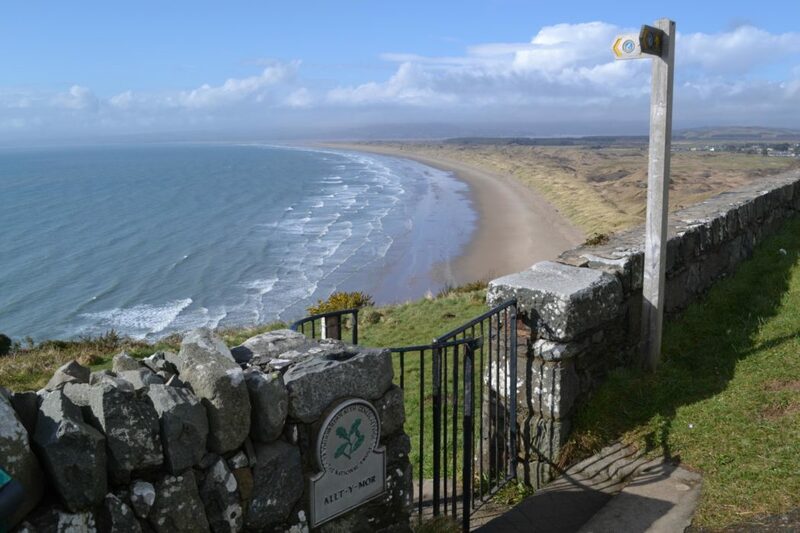 Then yet another sandy beach leads the fine 6km to attractive Aberdyfi, while out to sea lies the ancient and drowned legendary kingdom of Cantre’r Gwaelod. The scene changes. 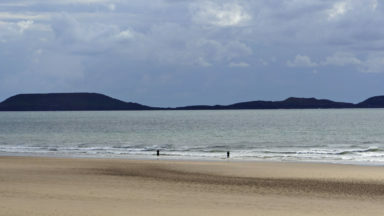 Just a kilometre away across the Dyfi lies the spit of land at the north end of Borth Sands. In the absence of a bridge or ferry this is two or three days away as the path makes its way well inland and back via Machynlleth. But this is no hardship, for the route is through some exquisite countryside, often high above the estuary. 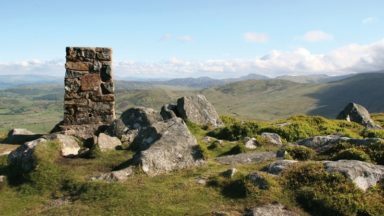 At Machynlleth there is the opportunity to visit the Centre for Alternative Technology and Parliament House, where the story is told of Owain Glyndŵr and his ultimately failed campaign to unite Wales into a single nation. On the way back to the coast an hour’s diversion goes via Furnace, named after its works (now preserved) that are said to be Britain’s best example of a charcoal burning blast furnace. 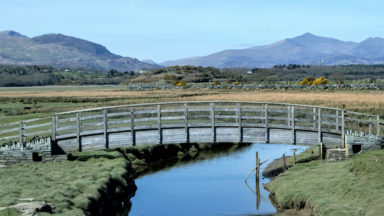 Wildlife enthusiasts will relish the next section of walk as it runs alongside the huge raised bog of Cors Fochno, part of the important Dyfi National Nature Reserve and home to a variety of water loving plants, insects (some rare), adders and otters. At Borth the Coast Path turns south, joining the Ceredigion Coast Path, whose actual start is at Ynyslas at the north end of Borth Sands. No self-respecting walker would miss this section out, for to do so would miss the great walk along these sands. Leaving Borth the coast path becomes much more rugged, and ranks with the finest coastal walking anywhere in the British Isles. 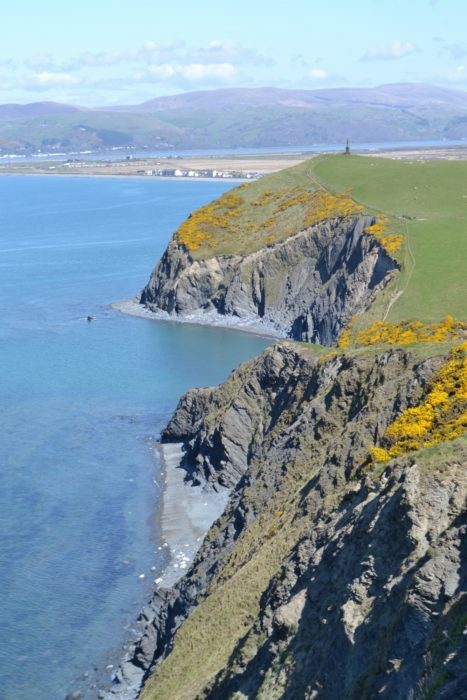 The high cliffs of Aberystwyth Grit lead via the isolated beach at Wallog, with its limekiln and glacial spit stretching far out to sea, to the tourist attractions of Constitution Hill (camera obscura, cliff railway and café), which commands an aerial view over Aberystwyth. 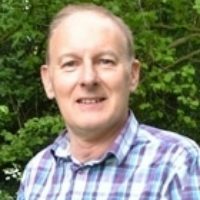 Aberystwyth, the largest town in Cardigan Bay, with its transient populations of summer visitors and students at the University of Wales, is a good place to stock up with supplies. You can explore the town museum or take a walk up to the monument on nearby Pendinas. Best of all is to spend an enjoyable day travelling up and back to Devil’s Bridge on the Vale of Rheidol narrow-gauge railway, visiting the spectacular Mynach Falls, and the Devil’s Punchbowl (for the best view of the famous three-tier bridge). 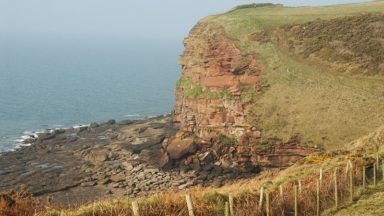 For many kilometres the dramatic coast continues, with the opportunity to detour briefly down a vertiginous path to see the stunted oakwood of the Pinderi Cliffs Nature Reserve clinging to the exposed slopes high above the sea. 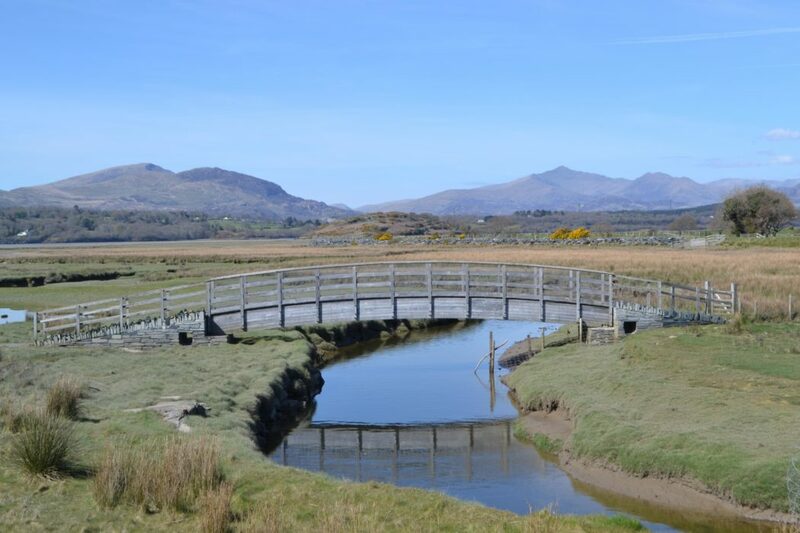 At Llansanffraed, the path passes through an area of some 140 narrow fields, remarkable survivors of the medieval strip field system, while at low tide a series of low stone enclosures (ancient fish traps) becomes visible. 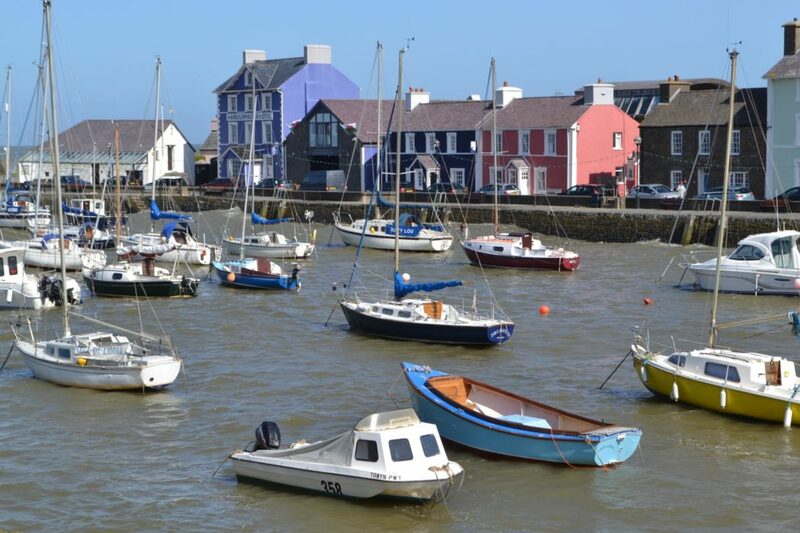 A narrow coastal plain leads to the small planned town of Aberaeron, a gem, with its brightly coloured houses and equally colourful boats bobbing in the harbour. A town trail (which would take an hour of so) visits many of the fascinating things that might otherwise be missed. 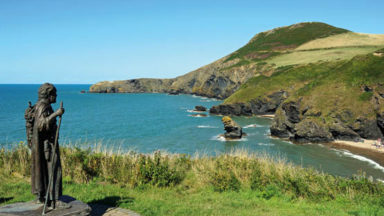 Just down the coast at Newquay, its houses rising steeply above the harbour, there is the chance to follow another trail, the Dylan Thomas Trail. He lived here briefly, Newquay being possibly the inspiration for Llareggub in Under Milk Wood. On through little Cwmtydu comes a truly spectacular section of coast past the hill fort of Pendinaslochdyn, the path then winding down to a small bay. From a cliff-girt headland to the south, the statue of St Crannog looks down over a couple of inns and a cluster of houses. On the other side of the bay a huge rock stack leans seaward, a tooth from the legendary giant Bica; and in one of three caves in the cliffs, smugglers once stashed salt. 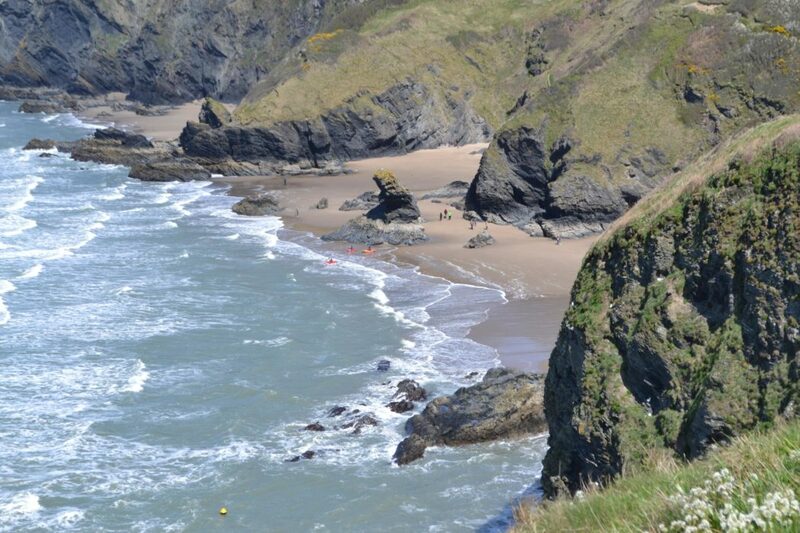 This is Llangrannog. A wild coast runs away south-west. At Tresaith, at low tide, a short walk round a headland leads to a fine waterfall tumbling over the cliff onto the rocks below. It is then fast walking on the Inclusive Access Path to quiet Aberporth. 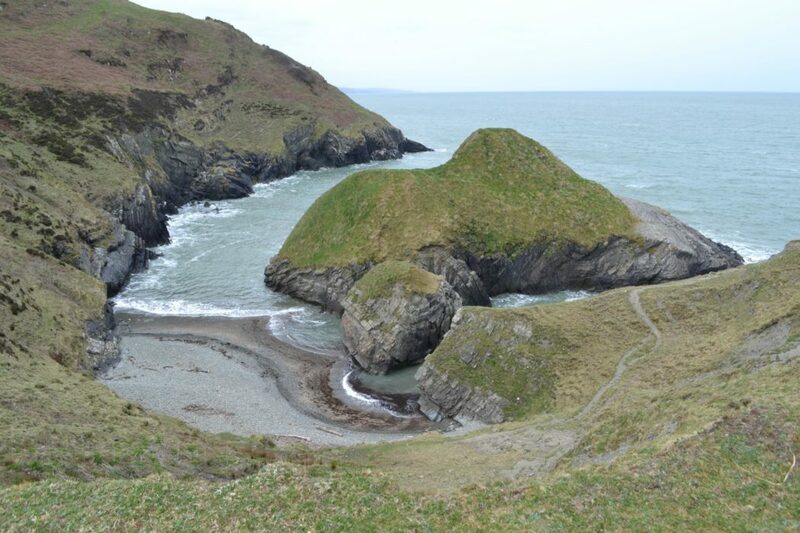 A final rocky stretch of coast leads to the conical hill of Mwnt, with a sailors’ chapel on its flank, and a sheltered sandy beach reached down a long flight of steps. The way to Cardigan now turns inland more or less parallel to the Teifi estuary, on lanes and field paths, the Ceredigion Coast Path ending by an otter sculpture beside the Teifi bridge, overlooked by Cardigan’s little castle. 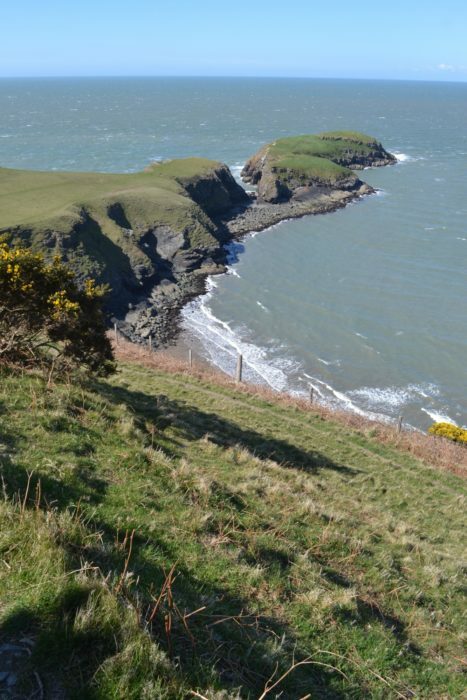 From here it is but a short hop via the ruins of St Dogmaels Abbey, to a small area of green beside the Teifi where the Pembrokeshire Coast Path officially starts, taking you on the next inspiring stage of the Wales Coast Path.